NASA researchers have found that several volcanic deposits on Mercury's surface require mantle melting to have started close to the planet's core-mantle boundary, which lies only 400 km below the planets surface and making it unique in the solar system. This is reported at the Goldschmidt conference in Yokohama, Japan. The recent MESSENGER mission to Mercury has shown that the surface of the planet is very heterogeneous, but it can be classified into two main types of regions. One is an area of relatively young Northern Volcanic Plains (NVP) - these are between 3.7 and 3.8 billion years old. The other area is older (4 to 4.2 Ga) and consists of intercrater plains and heavily-cratered terrains (IcP-HCT), which is between 4 and 4.2 billion years old. The older regions contain several previously unexplained features, including a large magnesium-rich spot, which is around 10 000 000 km square - around the size of Canada although because Mercury is much smaller than the Earth this spot takes up around 15% of the planet's surface. Until now, there has been no satisfactory explanation of how the formation and history of the planet would have allowed these heterogeneous areas to develop without invoking melting of a heterogeneous mantle. But now a group of NASA scientists from the Johnson Space Centre in Houston, have performed a series of experiments which explain most of the chemical compositions of Mercury's surface. 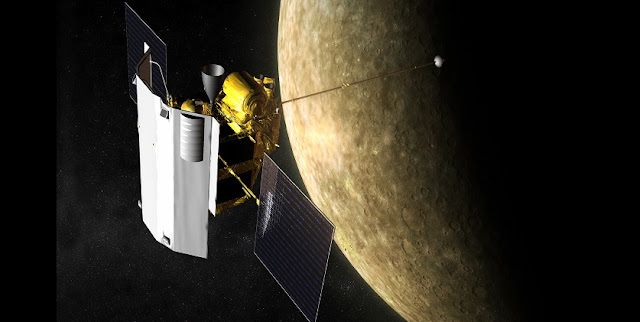 The researchers looked for the answers by simulating early conditions on Mercury. Mercury is believed to have formed under highly reduced conditions. Enstatite chondrites are similarly reduced and may be a good proxy to the chemical building blocks. So the researchers took the same chemistry as found in enstatite chondrites, and began to subject them to the sort of pressures and temperatures found in the deep mantle of Mercury. "We took a powdered chemical mix similar in composition to enstatite chondrites, which is thought to represent Mercury's building blocks, and subjected it to high pressures and temperatures. The pressures were high, up to 5 GigaPascals (50,000 times the Earth's atmospheric pressure), which is the sort of pressure where you can form diamonds. This is the pressure of Mercury's core-mantle boundary". She continued: "Mercury is a unique terrestrial planet. Unlike the Earth, it has a large core and a comparatively shallow mantle, meaning that the mantle-core boundary is only around 400 km below the planet's crust. The key finding is that by varying pressure and temperature on only one type of composition, we could produce the variety of material found on the planet's surface. These findings indicate that the older terrains are formed by material melting at high pressures up to the core-mantle boundary, while the younger terrains are formed closer to the surface. A few regions of Mercury's surface remain difficult to explain, but it does go a long way to helping us understand why we find such a variety of features".